Gluten free, moist and citrus-y coffee-time cake! 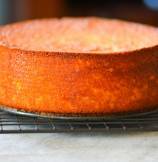 Sharing with you an easy, moist, gluten free and simply scrumptious Clementine Cake. 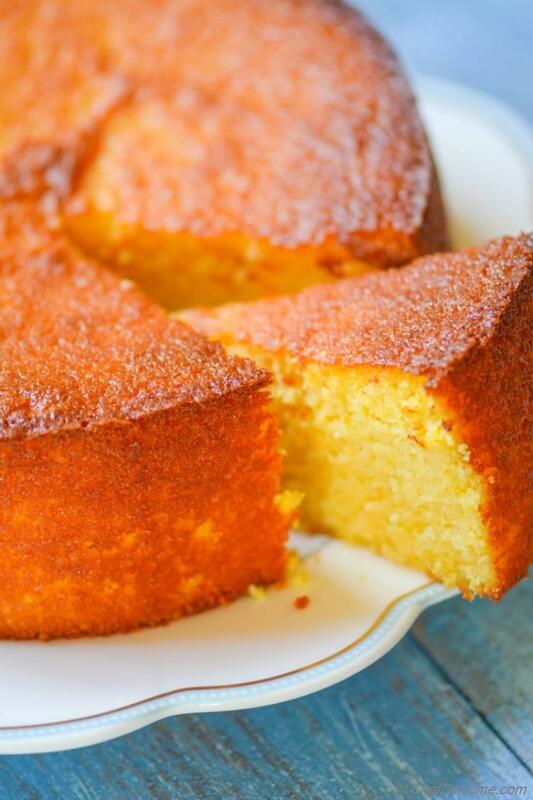 This cake was in my to-cook-recipe-list from a long time.... ever since I saw celebrity chef Nigella Lawson make this citrus-y cake on foodnetwork, I wanted to give it a try. When I started searching for her recipe, immediately three things were worth noticing. First, actually she made this cake long ago, not recently. Second, people are crazy for this cake and all big name bloggers, even smitten kitchen has written about it. Third, after reading the reviews, Nigella's cake is not just popular, it tastes exceptionally amazing too. Voilla!! My first instincts after looking at the cake pictures was not incorrect. loving it! 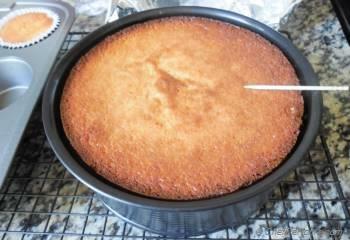 So, yesterday, I tied my kitchen apron and decided to try her very popular, clementine cake. 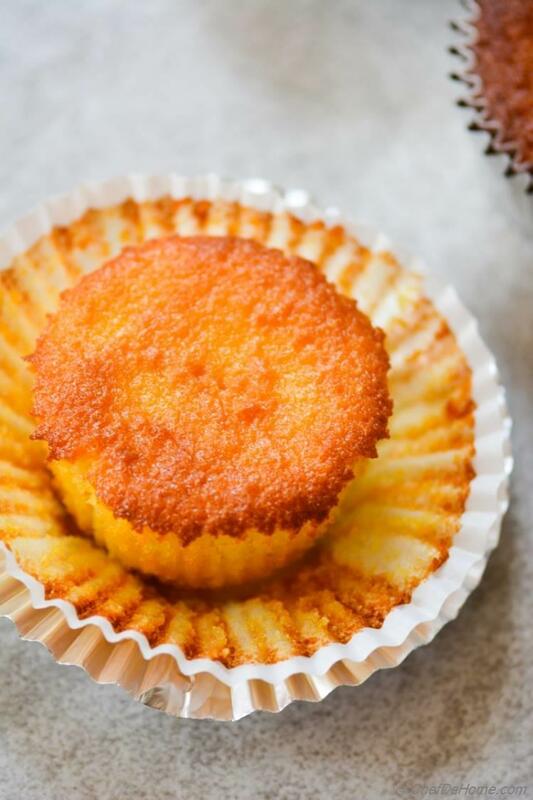 The best part about this cake - it has no flour, no butter, just pure and simple eggs and clementine doing magic with baking powder and almond meal. 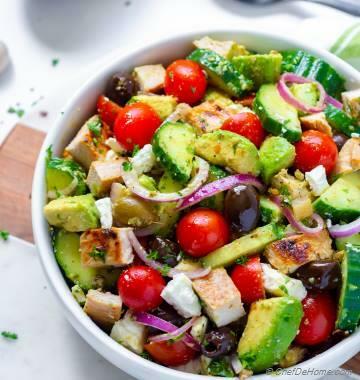 Needless to say, this is one of reason it is so popular among health conscious fanatics. Nigella's recipe asks for boiling the clementines in cold water for 2 hours to cook the skin and pulp. She has used whole clementine (minus pits) for this cake. Most reviewers had mix feeling about using whole clementines, some liked it and some found it very bitter. I was indeed apprehensive too. 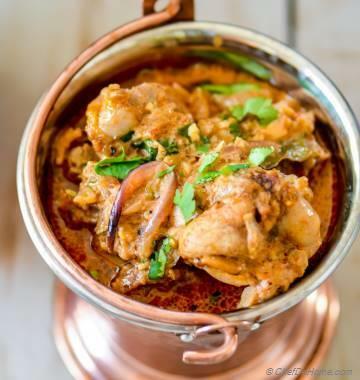 Just while reading the recipe, I decided to tweak it per my needs and my style of cooking. First and foremost, I did not want to use whole clementines, I am afraid it will make cake taste bitter. I decided to use only zest and the pulp, discarded the skin. Second, I don't want to perch in front of my stove for 2 hours for boiling and chopping clementine. I instead, just cooked clementine pulp in a shallow pan for 25 minutes with water and pinch of salt (to enhance the sweetness of cake). What happens when you change the first step of a recipe? Good you asked! Answer - You end up changing a lot other things... if not changed right, then? end up in disaster!! 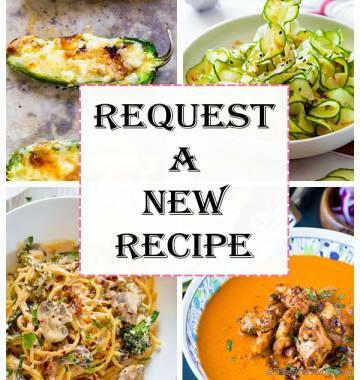 I am sure you wanna know, how did my recipe-tweaks went? Well, does these picture look like disaster in any form or shape? means?? It means, "The end" of this in-the-kitchen-with-nigella-lawson-clementine-cake-recipe story was pleasant, no disaster. All-in-all, a happy tummy, happy taste buds and happy husband ;) Amen! Cake, as expected, even after some tweaks, came out supper moist, citrus-y and as Nigella's say, "it tastes better a day after it's made", is indeed very true. But before taste, you eat with your eyes, right? 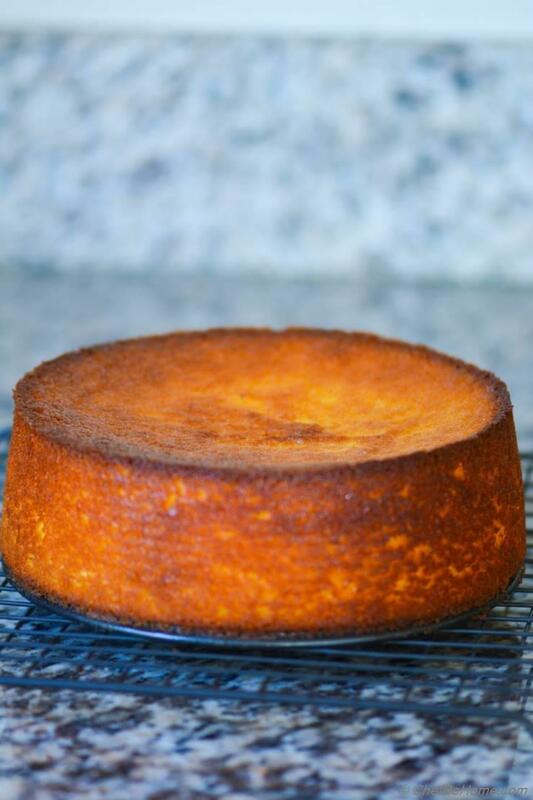 and cake look so beautiful when it comes out of oven, almost like hot lava burning behind coal wall, gorgeous amber color and since I used 7-inch spring-form pan, the cake was more in height than width which made it look like a beautiful aged-cheese-log. 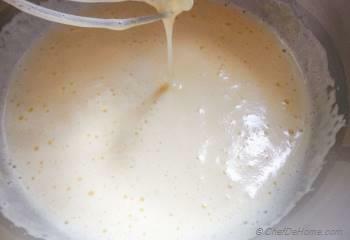 So beautiful that I initially planned to glaze the cake with lemon-sugar, but later just couldn't disturb it's beauty. If it was in my hand, I would have never cut a slice! Just place-it-in-glass-container-and-mount-on-a-wall! Using 7-inch spring-form pan (because that's the only spring-form pan I own!) turned out to be a blessing-in-disguise. Nigella's recipe was for a 8-inch spring-form pan and so is mine. 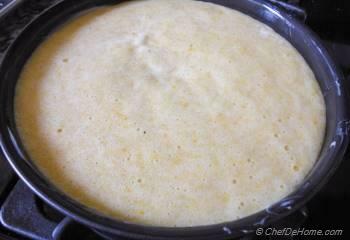 So, I had almost a cup of leftover batter after filling the 7-inch spring-form pan. I filled 3 cup cake liners and baked few sample clementine cup cakes for me. Either ways, even though I changed Nigella's recipe to meet my needs and apprehensions, the cake is really a good bake and I am so proud of these pictures too. Some how, evening sun-light did beautiful magic and made this cake look so awesome, even without any props/dressing - just plain, simply and beautiful! Hope you enjoyed looking at the pictures as much as I did. 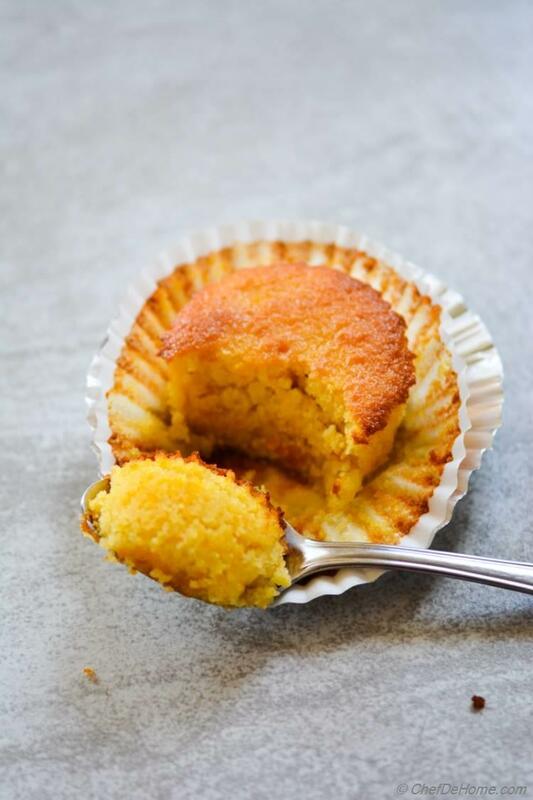 Feel free to try this recipe or head to Nigella Lawson's website for her Clementine Cake recipe. 1. Zest the clementine and set aside zest (about 1.5 tablespoon required). Peel off the clementine and discard the peel. Slice clementine in quarters. 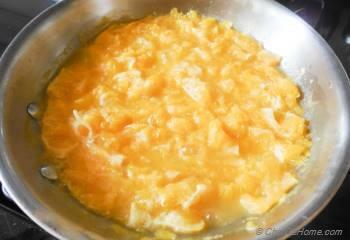 In a medium size pan, add clementine with 1/2 cup water and 1/4 teaspoon salt. Cook at medium heat for 25 minutes. Stir once or twice, in-between. Remove seeds of clementines if using seeded variety. 2. 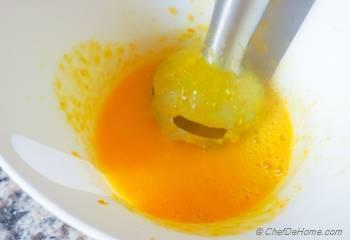 Puree the clementines and zest using food processor or a hand blender - yields about 1 and half cup liquid. Let puree cool completely. 20-25 minutes. Meanwhile, preheat oven at 375 degrees Fahrenheit. Butter or spray oil in a 8-inch spring-form pan. 3. 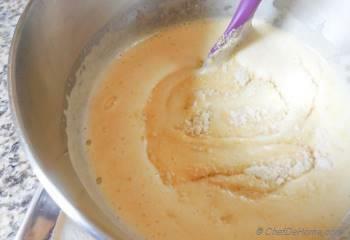 Cream the eggs and sugar using hand whisk or stand mixer for 5 minutes until creamy and pale yellow in color. 4. Mix in almonds meal, and baking powder. 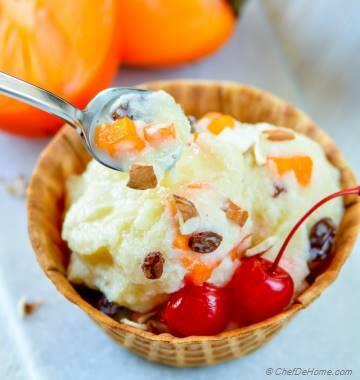 Mix well, add in the cooked and cooled clementines puree. 5. Pour the cake mixture into the prepared pan and bake for 45 minutes, when a skewer will come out clean; you'll probably have to cover the cake with foil after about 30 minutes to stop the top from burning. Cup cakes took total 30 minutes to cook, they were nice, brown and complete cooked yet not burnt. 7-inch pan cake took 45 minutes to bake, 8-inch might take 5-10 minutes longer, keep an eye after 30 minutes and check with tooth pick. 6. Remove from the oven and leave to cool, in the pan on a rack. When the cake is cold, you can take it out of the pan. Nigella says, and even I think this is better a day after it's made! Keep an eye on cake after first 20-25 minutes, cake tends to get brown on top pretty quickly. Cover it with foil and continue baking, if you see edges getting very brown. I covered cake at 30 minutes mark and as you can notice, it has little crumbly-dark edges. If decide to make cup cakes, that's a good idea too. 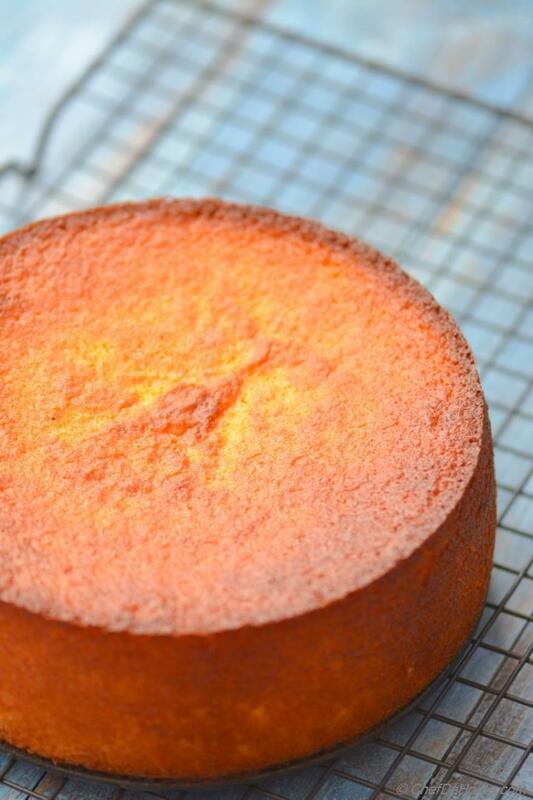 I really liked the texture of this cake, perfect for a lemon-glazed cupcakes. My cup cake batch was fully ready in 30 minutes. I took the cupcakes out at the same time when I covered the clementine cake with foil. mine look nice, but are &quot;saggy&quot; in the middle.... any suggestions to fix this next time? @amanda @marudhuskitchen, thank you so much. I am glad you like clementine cake. Kerry Mermel, cake is all yours! I wish i can pass you a slice ;) Cheers! Mmmmmmm! Savita Chefdehome, I want some cake! Can I make this cake in OTG? I don't have convention oven. Thanks in advance. @betterthanmartha, I am sure you will love the cake. 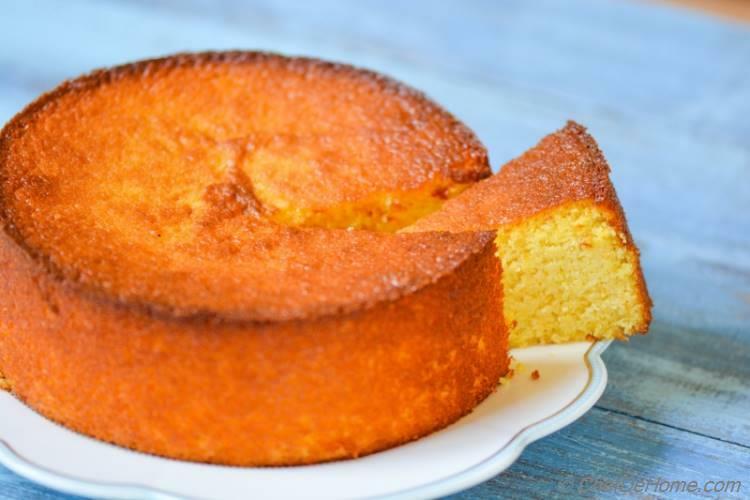 Due to using just zest and pulp instead of whole clementine, cake was not bitter and had just slight under-notes of mild orange bitterness at the end. happy cooking! Keyllene, clementine cake not just sound but taste delicious as well. i was amazed to find how moist it was without any oil/butter or dairy. I am sure you will love it. I agree Lynne, Nigella's recipes are great! enjoy baking! Keyllene, betterthanmartha, and Lynne, thanks for visiting. Beautiful click, Savita. 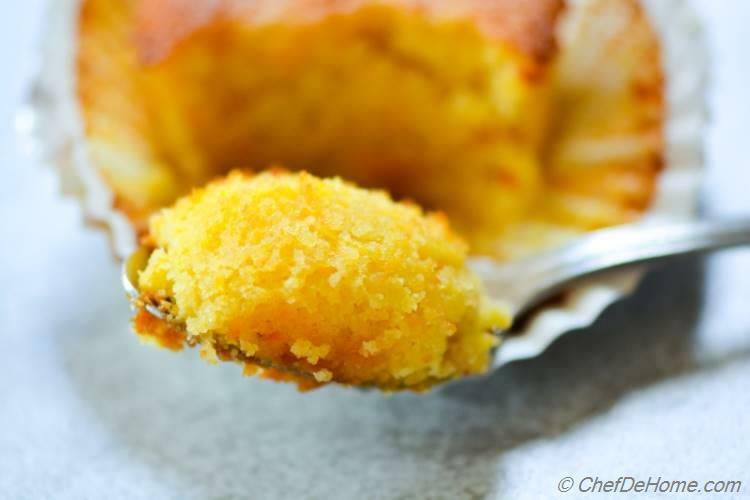 Clementine cake sounds delicious! I love baking and this cake is making me head to kitchen right now! 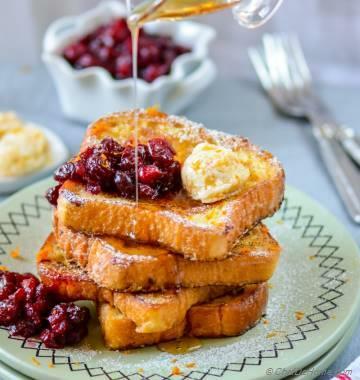 Lovely recipe and lovely pics. Can't go wrong with Nigella's recipes. love her! thanks for sharing this gorgeous cake! I am baking it soon!